How can I fix a slice? Can I carry a notebook? comments: How can I fix a left to right slice? A slice comes from many places. The most pronounced reason for a slice is an open clubface at impact. Also look at your clubface for impact marks. Are the marks on the toe, heel or center? The marks are indicative of the path the club is traveling on into impact. First, check and correct the way your hands are on the club. Be sure you are holding the club in the fingers of your left hand with the “V” between your forefinger and thumb is pointing at your right ear. Your right hand should fit so that the palm of your right hand fits against and on top of your left thumb and your thumb and forefinger of your right hand touch on the left side of the club. Once your hands are on the club, when coming into impact, try and be sure the clubface is looking at or preferably to the left of the target. When you start hitting hooks, then you are ready to work on your path. If the ball is starting left before it hooks and the mark is still on the toe, then start trying to direct your downswing out to the right. That will help starting to hit some draws. If you are willing to travel to Dallas, give me a call at (972)247-5622 for some help. If not find the closest PGA Professional to you who can help you get rid of that slice and learn how to hit that ball more towards target. comments: Thanks for answering the question last week. I also was wondering if it is against the rules to carry a notebook of your own advice or swing thoughts with you during a tournament. If I was caught with one of these would I get disqualified? I am glad my answers last week helped you. No it is not against the rules to carry a notebook. As a matter of fact, many great players I work with and almost all the touring pros will take notes during the lessons they take. However, they use these notes to help when they practice. From the practice they get to a list of “swing keys” they will use and help them on the course. During warm up they will get to one or two swing thoughts for the day and use them on the course. Some will write them in the front or back of their notebook, on the scorecard or on a piece of paper that they will look at when they feel they are losing the train of thought. Others just keep repeating it in their mind. Use your notebook on the practice tee. Develop some swing keys and practice using them for your casual rounds. Once you get used to doing this, it becomes as big a part of your game as your swing or your putting stroke. comments: I have been playing golf for 3years. When I hit a good drive the ball goes about 180yards, is that good for my age? What part of my game should I spend most of my time practicing. I had the opportunity to watch Tiger Woods win the Big I Insurance Youth Classic in Fort Worth when he was 15. At that time, Tiger was not very big, not even for a 15 year old. He won the tournament on a long golf course and it was done with one of the greatest short games I have ever seen and he still has it and wins with it on the PGA Tour. So keep practicing that short game, become the best around and watch your scores drop like a good cold winter day! Low shots and that occasionally move to the right sound like a problem of your body moving faster through impact than your arms and hands. The way to work on this is to watch the club hit the back of the ball. That will help keep your swing center behind the ball. Also as you do that, you will want to feel your arms swinging into the ball a little quicker than they are currently. Good Luck. 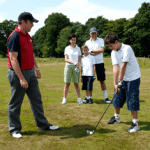 Find a close PGA Professional and get him/her to check out your moves. The best way to get used to the speed of the greens is to work on a consistent putting stroke so you can feel the speed on whatever greens you are putting on. Once that is accomplished, then you should be sure you have at least fifteen minutes to hit some putts on the practice putting green before you play each round. When you warm up your putting, concentrate solely on distance, hitting putts of 20, 40 and 60 feet. Right before you head for the first tee, hit six to nine putts from two feet and then you have the feel for distance and the confidence of your direction. I think you will be surprised by your new results. comments: My game is pretty good, but sometimes I get stuck over a shot. I may take as many as 45 seconds to hit the shot. I am afraid that I hold up the group. My knees shake and my club is never still. I usually play with the men who are our club’s best players. I enjoy the competition and feel that this is the best way for me to learn to play. My average score is 79 from the back tees. Please try to help. Thanks!! You are doing a lot of things right to become a good player quick. Finding good players to play with and learning to compete with them is one of the best things you can do become a great player. Now to your concern. Create a routine. Start on the practice tee. I assume you already have a routine of evaluating the shot at hand, selecting your club and preparing to hit the shot. It sounds like you are having a problem executing the shot. Therefore, develop a routine I call “See it, Feel it, Trust it” that I learned from Sport Psychologist Dr. David Cook At Kansas University. First part sounds like you are doing already. “See it” is seeing in your imagination and mind’s eye the shot you want to hit. Include in that the trajectory and the shape of the shot you want to hit and the target you want to hit. “Feel it” is while standing behind the golf ball and practice feeling the swing you need to hit the shot you need to hit by making full practice swings. comments: I HAVE BEEN PLAYING FOR ABOUT 1 YEAR. I LOVE IT. I WANT TO KNOW ABOUT GETTING IN TO COMPETING . I THINK I’M READY. I TOOK LESSONS FROM A LOCAL PRO .I ALSO WANT TO KNOW OF SOME PRACTICING METHODS FOR MY PUTTING . THANK YOU! You have taken a great first step by already taking golf lessons. Putting is a combination of having the right direction and the right distance. Distance is the most important. However you may want to work on your direction first. To work on direction first, set up to hit a bunch of 2-3 foot putts on a flat surface. That can be on a putting green or on a short carpet at home. This will help you learn to square the putter face through impact. That becomes very important for every putt. After you have learned to do that then move on to distance control. Distance control comes from the ability to make a consistent stroke that has the putter moving the same distance back away from the ball and the same distance though the ball in a pendulum type of movement. To work on your distance control, acquire some strings that you can cut into six foot strips and then place them horizontally across your target line at 20, 40 andv60 feet. Practice trying to get your putt to roll up to and stop on those lines. When you get that feel, then you will be able to really learn to read greens because you will have a feel for the speed of the greens and your confidence in your direction will let you know that you can start the ball on the correct line every time. You will find yourself getting closer on long putts, two putting a great deal more and making some putts from places you haven’t before. These are great drills that can be used over and over again to sharpen your putting. Keep playing and have a great time with this great game!! comments: Do you know of any Carolinas Junior tours and how to contact them? 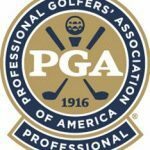 The best I can do is give you the PGA Section office for the Carolinas and have you contact them about their Junior Program. Write or talk to someone at the Carolinas office at 3822 Highway 9 East, P. O. Box 709, North Myrtle Beach, South Carolina 29597-0709. The phone # is (803)399-2742 and fax is (803)399-1504. Good Luck. I am sure they will have some information for you. comments: I have developed a low diving duck hook which refuses to go away. Can you suggest where I might start to look for a remedy. First, congratulations for hitting hooks. The 12-20% of the people who play golf that are known as good or better players hit the ball with some sort of hook. The rest slice the ball. First place to look is in the way your hands are applied to the club. Any hook is hit with a closed clubface. It sounds as if your clubface is severely closed. Therefore, since your hands are the only connection to the club and clubface, check to see what your target hand (left if you play right handed) is too far to the right on top of the club. And check to see if your right hand is too far right and “under” the club. Work slowly at turning your hands more to the left until your left hand is on top of the club and the back of your left hand is facing the same way your clubface is facing, towards target. The reason I say work slowly is that grip changes are big feel differences and if you do it slowly then you can make the overall adjustment a little easier. Find the closest Canadian PGA Professional and have him check out that grip first and then take some lessons. You are already on your way to becoming a good player, find someone to help you create better swing and practice habits.